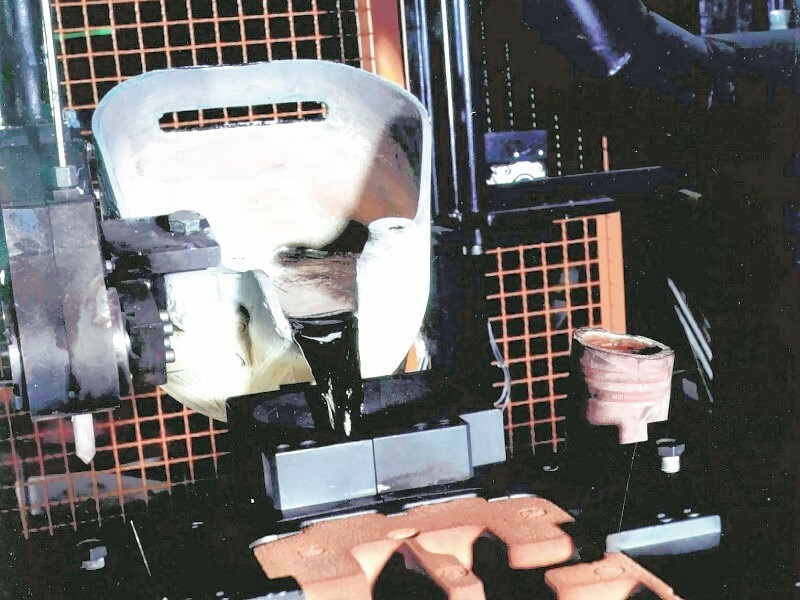 Manipulator with freely moving axes and a mounted casting ladle for automated ladling and pouring of melts, especially used in gravity die casting and pressure die casting (Fig. 1, Fill GmbH).During ladling, the desired melt quantity is measured precisely by accurate tilt-positioning of the casting ladle using a position sensing system. This results in high dosing accuracy (see Table 1, Fill GmbH). Even at high traversing speeds, the control unit with its freely programmable acceleration and deceleration ramps ensures rapid but smooth conveyance of the melt to the casting position. Following low-turbulence pouring of the liquid metal into the gravity die or shot sleeve (Fig. 2, Fill GmbH ), the casting ladle is turned over (if necessary, by up to 360°) at a programmable position to discharge any adhering oxide film. The casting cycle of the casting manipulator is freely programmable and can be adjusted to the casting location and the casting process.The use of a casting manipulator provides high flexibility, cycle times can be reduced and optimized and a large operating range can be covered thanks to X-, Y- and Z-axes with an integrated casting axis. 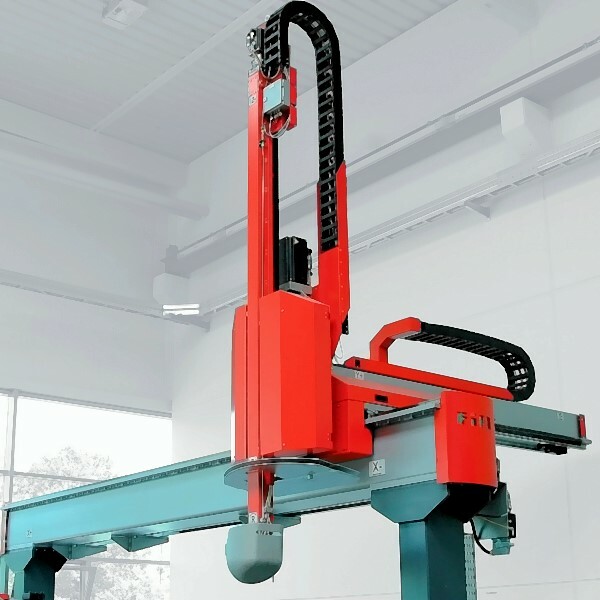 Servo drives in conjunction with stable guide rails ensure low-turbulence pouring and high traversing speeds. In addition, state-of-the-art designs of casting manipulators enable simple and quick replacement of the casting gear thanks to pluggable spline shafts. 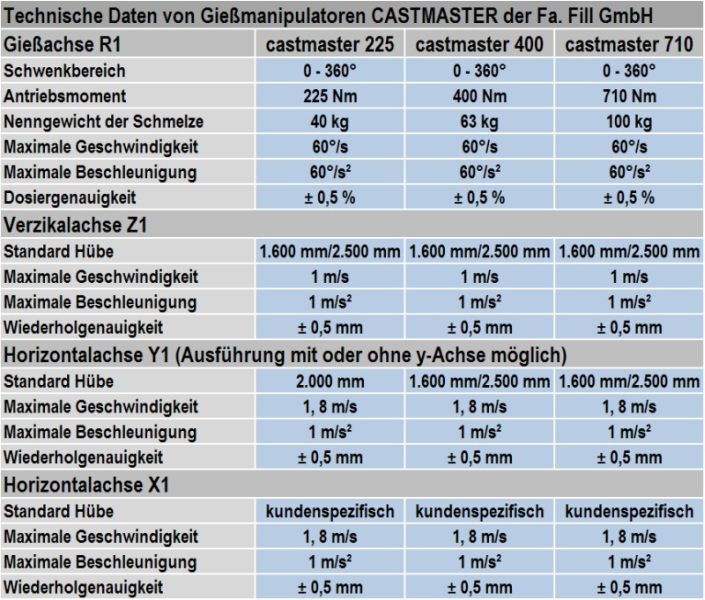 The technical data for selected casting manipulators are given in Table 1.